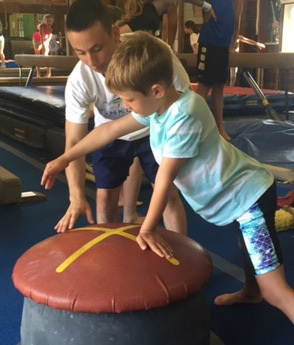 The “Counselor In Training” Program gives selected campers, with a minimum age of 15 years of age, the opportunity to gain leadership skills, learn safety and progressions and spotting in specific gymnastic levels and events under the supervision of USAG Safety Certified Gymnastics Instructors. In addition CITs are given responsibilities with younger campers and kitchen duties. Each week CITs meet with counselors and plan a special CIT Star Night to celebrate their week’s success! This wicked, awesome Dunkleysevent has included: a sunset ski and camp fire, after dinner hikes on the cut, bike rides and ice cream at Sebs, an evening shopping trip in Burlington… The Dunkley CIT Program is a valued program with ninety percent of our staff coming from the CIT and JC program. It is an excellent opportunity for further involvement with gymnastics; many CITs/JCs (Junior Counselors) have gone on to coach at clubs, High Schools and Colleges around the USA! We look forward to working with you this summer. Please email or call with any questions about the program.